Dream A Little Dream of Me was composed by Fabian Andre and Wilbur Schwandt , with lyrics by Gus Kahn . The song was first recorded in 1931 by Ozzie Nelson and His Orchestra . 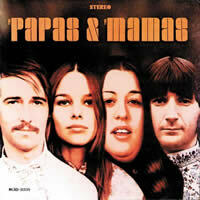 The Mamas & The Papas released a version in June, 1968 from the album - The Papas & The Mamas . Bass Notes /C - /B - /A: Played as single notes if you are finger-picking. Simply play the C chord and then the 3rd finger on string 5 (3rd fret) plays the C bass note - slide 3rd finger down 1 fret and play the B bass note - then take the finger off the string (open) and play the A bass note. If you are strumming chords, you can omit these. THE MAMAS & THE PAPAS chords and lyrics are property and copyright of their owners. "Dream A Little Dream of Me" chords and lyrics are provided for educational purposes and personal use only.